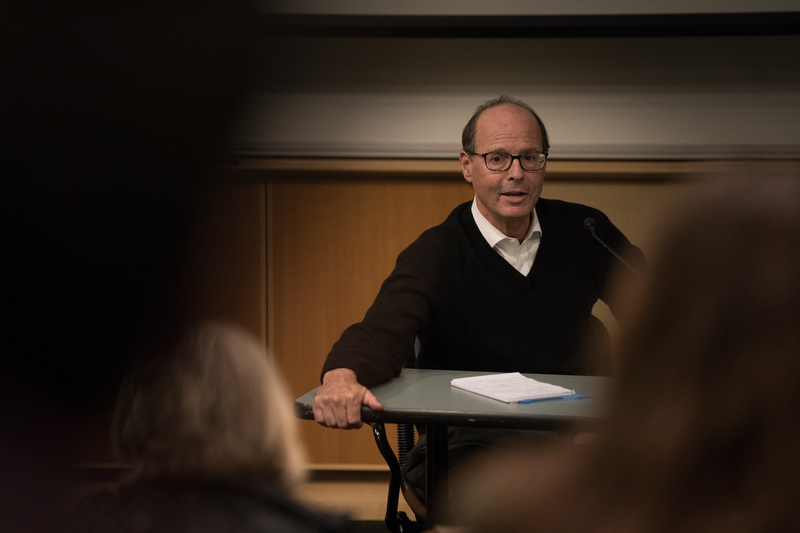 On October 16, 2018, the Center for Media at Risk hosted a screening of Thomas D. Herman’s documentary film, Dateline-Saigon. The event was co-sponsored with the Annenberg Public Policy Center and Penn Cinema and Media Studies. The film tells the story of a group of five reporters based in Saigon at the outset of the Vietnam War and the resistance, intimidation and censorship they faced from the American government and Kennedy Administration. Herman’s film reveals important insights into our own era of reporters and media at risk. Before the screening, ASC PhD student Hanna Morris had the opportunity to sit down and talk with Herman about his new documentary film. You’re a lawyer by training, but you’re making films. How did you become interested in making this film and what motivated you to make it? Well, I joke that practicing law allows me to indulge my bad habits, like filmmaking. I initially got the idea for this film when I was a field producer for CNN, and I spent some time in Vietnam for one of the anniversaries of the end of the Vietnam War. I met a number of journalists. Some were back there for reunion, journalists who had covered the war; some were still working journalists also who had covered the war. listen I started listening to their stories and thought, ‘it’s time to capture their voices, their stories, their narratives,’ while there was still time. And to try to address some of the lingering controversies about journalism and the Vietnam War. What about the Vietnam War drew you to this story? You know, there was a narrative for a long time, by people critical of the media, that the media lost the war because of the media’s critical commentary. I think that more balanced and more modern study of that academic study has put a lie to that misrepresentation. But that got me going on it. When I first started the film I didn’t know what the film was going to be. I thought, ‘let me interview as many journalists, print journalists, TV journalists, photo journalists, academics, who covered the war, and we’ll see what comes out of it.’ I ended up interviewing 75 or 80 people, from those who covered the war even before the Americans were involved through the end of the American involvement. What emerged is this film, Dateline-Saigon, which profiles five journalists who were among the first to be critical of American involvement in the war. It’s the story of what happened to them when they began to write critically. Each of them went on to win a Pulitzer Prize for his efforts; these five were all men. There were some extraordinary women, by the way, who I could talk about if you’d like to ask me about those. These five people were at the very early years of the American involvement. They went over to Vietnam as very patriotic children of the Cold War. They wanted to support the American effort; they believed what they wanted to believe, what the government was telling them. They all came of age during World War II. listen They came to a patriotic consciousness and a political consciousness during the Cold War; and they got over there and found that things were not as advertised. Fascinating. You did mention that you interviewed 75 to 80 people, and some were women. You said, I think, that you interviewed some local journalists too? As in journalists in Saigon. Yes. The journalists I interviewed in Saigon were western journalists. It was interesting. I wanted to interview some Vietnamese journalists, but we were restricted by the government. I tried to, but at that point, I think this was, oh, now 15 years ago; things have loosened up a little bit, but even obscuring faces and voices, the Vietnamese journalists I met were just too nervous about talking to me. So I interviewed Americans, Canadians, Germans, French journalists, Dutch journalists. You mentioned how you narrowed in on the five that you chose, but could you tell me a little bit about why you chose those five? And why all men? Sure. What I discovered is that the story in this film is a story that’s very much unknown. listen That very early in the war, these young journalists, who were Cold Warriors, rah-rah Americans, began to be critical once they saw that the government was not telling the truth, particularly the American government about the extent of our involvement in the war. They began to report that. What happened to them? They were called traitors. They were beaten up. President Kennedy tried to remove one of the most famous, a fellow named David Halberstam. Kennedy tried to have the publisher of the New York Times—Halberstam was a famous New York Times reporter—take Halberstam out of Vietnam because he was reporting critically and it embarrassed him. But to the credit of the publisher of the New York Times, then a fellow named Arthur Sulzberger, whose grandson is now running the New York Times, they kept him there. I also learned–this was news to me–that one of my heroes as a boy and a young man, President Kennedy, was really the first president to get us deeply involved in Vietnam and he lied; he misrepresented what we were doing, and he tried to conceal it. That was news to me and for many who were not academic specialists in this area, that’s a big surprise. For these five journalists that you featured, in what ways were their experiences, in terms of what you’re describing, similar and different to other journalists at the time? Excellent question. These were five young people; they were all in their 20s when they were sent over there. They were outliers. listen Most of the press in Vietnam in the early years and even in the later years were very much supportive of the American effort in Vietnam. So, these people at first were supportive themselves, because they wanted to be, because everyone else was, because they went to press conferences and wrote down what the press briefer was saying. But then they started to be critical. They were talking particularly to American soldiers who were very upset with how the war was being prosecuted. The field-grade officers, not the top generals. Then these journalists themselves were criticized by other journalists, particularly by the older men and women who said they were clueless, they were naïve, they were idealistic, they didn’t really see what was going on. listen It turns out that most everything they were reporting was true, even when the government was saying it was false. After the war, there was a famous publication, which is known as the Pentagon Papers. You may have heard of it. Ultimately, as a result of the publications of the Pentagon Papers, what they had reported was revealed to have been very true. Interesting, so the journalists faced some initial push-back and claims of false reporting, but were ultimately proven correct with the Pentagon Papers. Another very important point is these five people. I haven’t mentioned them, other than David Halberstam, who was writing for the New York Times. Neil Sheehan, who was then writing for the United Press, these are wire services, and three legendary reporters for the Associated Press: Malcolm Browne, who was the Saigon Bureau Chief of the Associated Press; Peter Arnett, who went on to some fame as a reporter for CNN years later; and a great photo-journalist, one of the most legendary photo-journalists of that era, a German fellow named Horst Faas. All of these guys went on to celebrated careers. This was their first big story. For each–I interviewed them all numerous times–this was the most important, most meaningful story of their entire journalistic careers. While these five were intensely competitive with each other, they wrote for competitive news services and magazines, they all became very close friends. listen As the film reveals, when they began to be attacked, they had to draw together to protect each other; that’s part of the narrative of this film. I know that this is your second film about war. What makes war an important topic to address? Well, in war, everything’s on the line: people’s lives, the national economy … There’s an old saying: “In war, truth is the first casualty.” Well, if a country is sending its young men and women off to war to sacrifice for war, the mothers and the fathers and the sisters and the brothers and the tax-payers who are footing the bill ought to know what’s going on–not only what the government is doing but what their sons and daughters are doing, hopefully to protect the country. listen If things are going poorly, and the government for its own reasons, political reasons and otherwise, wants to cover it up, the first line of defense in getting to the truth is journalists. I know one of the mantras in reporting Vietnam was to speak truth to power. I’m wondering, just shifting to the present day, do you think that this mantra still holds today? In which ways is this the same or different? Are there threats today that didn’t exist in the Vietnam era? Another very good question, well, questions. Vietnam is taught to military public affairs officers, the PR people, as how not to run a war. In Vietnam, there was very little censorship and the journalists could go practically anywhere they wanted or anywhere they dared. They were able to get a lot of information. As a result of that freedom of access, the American government, at any rate, severely restricted access and imposed censorship, backdoor censorship and otherwise. Access to what’s going on in conflict zones or on the battlefield today is much less than it was in Vietnam. That said, the danger to journalists today generally is much greater than in Vietnam. In Vietnam, except toward the end of the war and in Cambodia, journalists weren’t targets. The other side, the North Vietnamese side, the Viet Cong side in the Vietnam War, understood that journalists could get their side of the story out. But today, we’ve seen what’s happened, sadly in Iraq, in South Asia where journalists not only are targeted, but are being killed. And not accidentally; they’re being executed. There are lots of differences. I can give you some more differences. Back in the early 1960s, the period upon which this film’s focused, there were no cellphones and there wasn’t really a direct telephone cable from Vietnam to the United States. So these reporters had the freedom to go out and spend time to develop the story. Today, that freedom doesn’t exist because you have cell phones and people are expected to file multiple times a day. So there’s a balancing act. There are some fun stories that the protagonists of this film tell about filing. Not only did you have to gather the story and write it, but then how do you get it out of there? There are some wonderful stories about people running out to the airport, throwing a bag of film and, well, there weren’t computers then, and so they had to give a copy to a flight attendant, saying, “When you get to Clark Field in Manila, I’ll have an AP office messenger there to pick it up.” There were a lot of fun anecdotes along those lines. It’s a lot different today. Did you personally face any push-back or intimidation when you were making the film? Yeah. I went over to Iraq, to Baghdad, with Peter Arnett, one of the protagonists. This was during a very dangerous time in Iraq, in Baghdad. There were roadside bombs and IEDs; it was dangerous. We had to register with the American Command and the Public Affairs officers. We went in, and there’s some footage of this in the film, we walked in behind these sandbags and barbed wire, we had to agree to the rules. Among the rules were: we were not allowed to quote anybody without attribution, meaning anonymously. You had to site ‘Sergeant this’ or ‘Colonel that,’ which is a back-door way of censorship. If we wrote a story—now, I was making a film, Peter was doing some reporting—if Peter or I had quoted a soldier and not put his or her name on it, we would have lost our credentials and been kicked out of the country. If we had put their name on it, well, David Halberstam had a great line. He said, “If you quote a general or a colonel being critical, by tomorrow morning he’s no longer gonna be a colonel or a general,” so people are reluctant to talk. We also had to run around in flak jackets. In your opinion, what is the role of a documentary filmmaker and what should documentary filmmakers seek to do or achieve with their films? I think, if you talk to different documentarians, you get different answers. I was on a panel recently for prominent documentary filmmakers and me; each of them more prominent than I. A similar question was asked. I can only report as to what Tom Herman would do. listen What I try to do is to find a story that is not particularly well-known but that is very much relevant to what is happening today; and then try to let the protagonist in the story reveal the truth. I don’t want to take sides, I don’t even want to become a character in my film. I try to keep my voice out of it. But to report something that’s important today but that has historical resonance. I think that’s my role. The cliché is to tell that truth, of course that’s what we’re trying to do, to strip the layers of propaganda and other things aside, to try to get to the heart of a matter. I’m now working on another film. When I start a film I don’t often know what the film is gonna be, where it’s gonna take me, but that’s part of the joy of this journey of discovery. I like that. Well said. You mentioned you have a new project. What is it? Well, I am helping to produce a film on a prison re-entry program in Louisiana. Again, the prison is a notorious prison that during the Civil War era was a slave plantation. Now it’s a big prison with a very progressive re-entry program. Much more progressive than the correction system in my home state, which is Massachusetts, which people think of as very progressive. But it isn’t. Here we are, in the deep south where people expect chain gangs and so forth, but there’s a very progressive re-entry program, helping people come out of prison and stay out. We’re going to try to talk about that and illustrate it. listen I like to make my films character-driven, not necessarily issue-driven. The issues will come through the characters. I think it’s important in making a film not just to have a message, and maybe not to have a message. But to seek answers. And while being serious, also to entertain. After all, we’re trying to capture people’s attention for an hour-and-a-half or so. The Reflections series incorporates SoundCite, seamless inline audio created by the Northwestern University KnightLab. While not a perfect science, SoundCite allows the reader/listener to experience interviews in a new and interactive way.